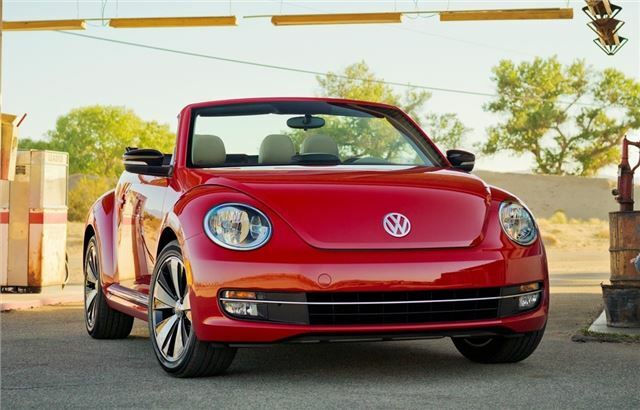 Volkswagen has unveiled the new Beetle Cabriolet. The drop top sticks with a traditional soft top which automatically opens and closes in just 10 seconds and there's a soft-top cover as standard. It's set to go on sale in Spring next year. The styling continues with the sharper lines and lower stance of the new Beetle, while inside it gets the same interior with a large central speedo in the instrument cluster and flat glove box reminiscent of the original Beetle. Due to the folding hood, boot space is cut compared to the standard Beetle, down from 310 litres to 225 litres but there is a folding rear seat. There are seven engines available starting with the 1.2 TSI with 105PS and there will also be a BlueMotion version of this model. The other petrols include the 1.4 TSI with 160PS and the top 2.0 TSI with 200PS. There are two diesels, the 1.6 TDI with 105PS that also comes as a BlueMotion Technology model plus the ever popular 2.0 TDI with 140PS. The Beetle Cabriolet comes with an active rollover protection system which consists of two extendable modules fitted behind the back of the rear bench seat. If the car rolls over, these pop up via the central airbag triggering unit. Meanwhile, Volkswagen has added an R-Line model to the Tiguan line-up. Based on the SE, it gets xenon lights, 18-inch Mallory alloy wheels, black wheelarch extensions, redesigned bumpers and a rear spoiler. Inside there are front sport seats and two-tone upholstery, a leather multifunction steering wheel with aluminium trim and and stainless steel pedals. The R-Line is available with the 2.0 TSI engine with 210 PS and 4MOTION four-wheel drive or the 2.0 TDI with either 140 or 170PS and 4MOTION. All R-Line models come with a standard six-speed manual gearbox. On the road prices start at £28,020 for the R-Line 140PS. There is a £680 premium for the 170 PS diesel, with the petrol model costing £28,435.